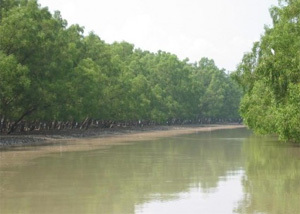 Raidighi is a popularly gateway of Sunderban, the place offers a real visual treat to the nature lovers. You can savor a breathtaking view of emerald green vegetation and forest covering major portion of Raidighi. The site also boasts of some exotic wildlife and birds. The River flowing through Raidighi is blessed with loads of fishes and crabs. Apart from these, the place also has religious importance, as it houses a number of temples and shrines. Moreover, the place also treasures some remarkable architectures belonging to the Maurya, Gupta, Pal and Sen Periods. Raidighi has been named after a large water body. Many decades ago, Raidighi was known as Rainagar. During 1489 AD, Rainagar was established by Shubuddhi Ray, who was the ruler of Gour. Afterwards, in 1492 AD, his son, Durgadas Ray, dug a huge water body spanning an area of 33 acres and the name of Rainagar was also changed to Raidighi. Today also, the prime attraction of Raidighi is this massive water body. There was a fort called Raimangal Fort in the north-east corner of the water body, which was attacked by emperor Akbar in 1595 AD, where he wage a war against Rangeela Ray, the son of Durgadas Ray. Thus, if you want to savor the authentic essence of rustic Bengal, Raidighi is undoubtedly one of the prime destinations. Places to see in Raidighi: Raidighi is a small town on the fringes of the Sunderbans. You can take a ride in a launch and roam around the rivers of Sunderban and watch the wonder of nature and wildlife unfolding. Sunset over the Sunderban is a spectacular site. Temple of Tripura Sundari: This age-old temple is located just five minutes away from Krishnachandrapur. The temple is noteworthy as it was blessed by Sri Chaitanya on his way to Nilachal. The fourhanded deity of the Goddess of Shakti, worshipped in the temple truly evokes a sense of spirituality. Padapith Tirtha: During 1510 AD, people at Gaur were experiencing unrest, due to the war, which broke out between Hussain Shah, the Nawab of Gaur and Prataprudra, the King of Orissa. At this point of time, Sri Chaitanya, who preaches the doctrine of peace and love, visited the house of Ramchandra Khan, a reputed scholar in the village. Now, the footprint of Sri Chaitanya has been preserved at the place, which gradually became popular as ‘Padapith Tirtha’. 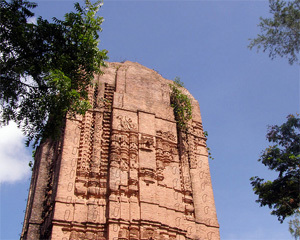 Jatar Deul: This huge deul measuring 60 feet in height is a historical structure. It was built by Raja Jayanta Chandra during 975 AD. Temple of Andhamuni: This temple is located nearby Andhamunitala. It is a strong belief of the locals that a number of ailments, especially related to eye are recovered by offering prayers in this temple. Barashi Shiva Temple: This is an ancient temple of Shiva located at a distance of one kilometer from Kashinagar or half kilometer from Srimatiganga. Here lord Shiva is popularly called ‘Bojurkinath’ and worshipped with much pomp and gaiety every year. Beside this, prayers are also offered on every Monday and Friday. Khari Chatrabhog Museum: This museum, maintained by Dinabandhu Nashkar is located within close proximity to Kashinagar. The museum preserves some ancient historical articles like coins and statues belonging to the Maurya, Gupta and Pal dynasty. Maibibi Temple: This temple is located in the Kashinagar Bazar. The temple is mention worthy as both Hindu and Muslims offer their prayers here. 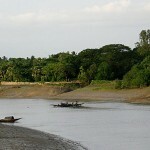 Raidighir Dighi: This is a huge water body spanning an area of 33 acres. Ruins of the Palace of Shewt Raja: You need to cross River Mani to reach this historical site. Some portion of the site has been excavated, which reveals some specimen of an ancient civilization. It is believed that many unearthed palaces, temples and houses will surface out if the site is excavated by the archaeologists. House of Pilkhana: Nearby the ruins of the palace of Shewt Raja, there are remnants of some prehistoric houses, which have been engulfed by River Mani. Surprisingly, the structure and size of the bricks found at the ruined site has similarity with the remnants of the palace of Shewt Raja and Jatar Deul. Nearby attractions around Raidighi: You need to drive along the meandering roads of the villages of Raidighi, to reach Jatar Deul, located seven kilometer from the town. The journey is quite pleasurable. Moreover, the breathtaking view of this Jatar Deul, a grand temple devoted to Lord Shiva is truly adorable. This 60 feet structure of the temple is a treasured piece of architecture, constructed in the 11th century by a king belonging to the Pala dynasty. A fair is held during the Baisakhi, centering the temple. 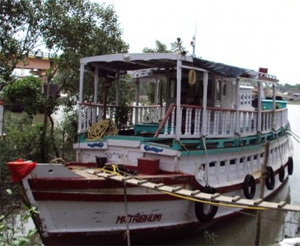 Things to do in Raidighi: Your trip to Raidighi will remain incomplete without a launch ride around, which offers a spectacular view of the Sunderban Forest and the surrounding islands. You can reach the famous Kumari forest in just an hour’s ride by the launch. Forests like Dhanche forest is equipped with watch towers, while other forests like Chamta are the haven of Royal Bengal Tigers. The launch ride will also take you around the desolated island of Nagchara, which is the home of snakes. If you are enough adventurous, arrange for an over night stay on the launch. You can also savor the spectacular sunset from the deck of the launch. The chirping of the birds is truly enchanting. 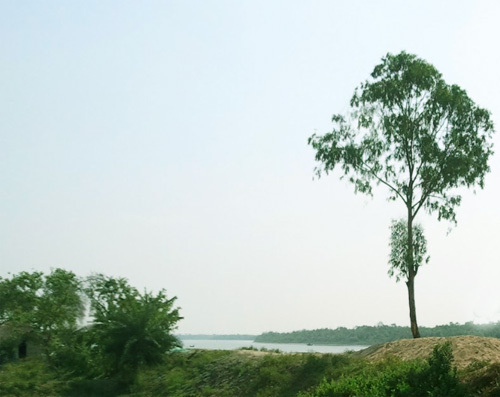 How to reach Raidighi: It is truly fascinating to find the town of Raidighi, nestled amidst a tranquil ambience, located just 110 km from the pulsating city of Kolkata. Raidighi is accessible from Kolkata by both bus and car and it takes around four hours to reach the destination. Buses to Diamond Harbour are available from Esplanade in Kolkata. From there you need to board another bus to reach Raidighi. You can also travel to Bishnupur by bus. Autos are available in Bishnupur heading to Raidighi. Luxury buses are available to Raidighi from Esplanade in Kolkata. Moreover, you can also avail bus, auto and trekkers from south Bishnupur to reach the place. You can also drive along Baruipur, Jainagar and south Bishnupur to reach Raidighi. If you want to commute by train, then avail trains heading to Lakshmikantapur, Kakdwip or Namkhana from Sealdah railway station. You need to drop down at Mathurapur Road Station from where trekkers, autos and buses are available to Raidighi. Best time to visit Raidighi: You can visit Raidighi any time of the year. Lodging and dining facilities in Raidighi: Affordable as well as comfortable accommodation facilities are offered by a large number of hotels found in Raidighi, mainly centering around the town market area. 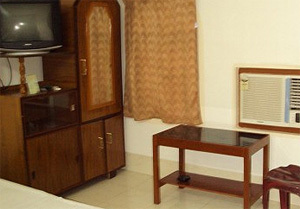 The hotels also offer decent dining facilities, providing a number of non-vegetarian items. However, the varieties of vegetarian items are quite limited.